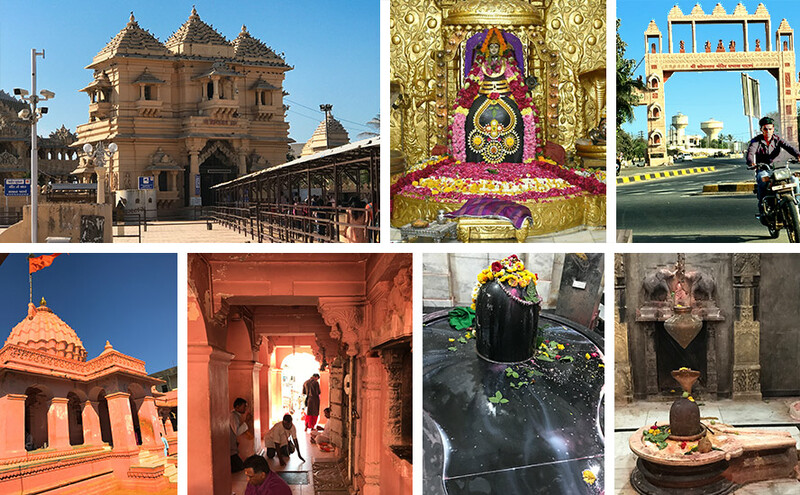 In our eighth sojourn of spirituality, it was time to head for sacred Sri Somnath Jyotirlinga, the first amongst the twelve jyotirlingas. We decided to seek the divine shelter of the mighty Shiva in the eternal cultural pilgrim of Saurashtra in Gujarat. The 800 km stretch from Bhopal to Rajkot(SH-18/NH-47) required 13 hours to complete, thus we commenced the journey early in the morning. The sight of the scorching summer sun started showing its effect early. As we left Ujjain, situated in the heart of the Malwa Plateau, the gawky rock garlands in the tribal region of Jhabua caught our attention. The single lane road seemed parallel at times while circular at other. The process of closely looking at the modest tribal lifestyle peeping throught the leafy huts, continued on the way. The tribesmen wearing Ghutanna Dhoti, Kurta and turbans folded on their heads and the women decked in Bhilaundi Lehengas, Polka and stole like permanent Tatoos were both looking refreshed even in the scorthing heat. We saw the extended Maahi river originating from the Vindhyachal range and Anas river with its facilitator Mod on our way in Dahod. The pious river Maahi is known as the goddess of 4 eras having 84 areas and 9 lords. We were busy knowing more about the stunning sedimentary rocks originated from geological changes witnessed by the region around 65 crore years ago. The Geography Professor of the Baroda University, Roli Kanchan, shared the information of the erosion of Phyllite, Granite and Bassaltic Rocks in this region. We also came to know that the yellow-brownish soil came from Phyllite, the loam-sandy soil from Granite and the Black Soil came from Bassalt rocks. 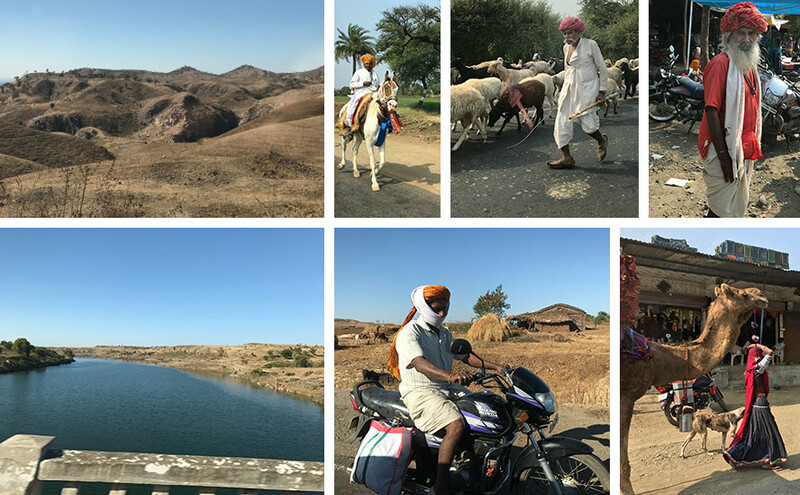 As we entered Gujarat, our way was blocked by the Rebaris- a nomadic extinct shepherd community of Gujarat. We moved ahead watching the attractive adornments and the camel back households of this hard working nomadic tribe, their hypnotism with dreams and their excessive pleasure. As we touched the Gujarat border, the superb infrastructural arrangement with six lane roads, gave us the feeling that, “Hu Gujarat Maa Chhu”. In some time, we were charmed with the blood red flowers of the Rajgira fields. The scenery of yellowish flowers of the mustard fields was visible from the luster of the Rajgira, partaken in fast. In this sequence we also saw a green bed spread of Fennel yields and Tuar betweeen a three feet high crop of sesame plants, the swinging white flowers coriander crop, the reserved teak trees near the fields and the roofy Nilgiri Trees. As we reached Saurashtra we were mobilised by the Kathiyawadi laden commuters of the “Chakadas” powered with Bullet engines. The process of Capturing each angle of these moments from the mobile camera was continuously going on. 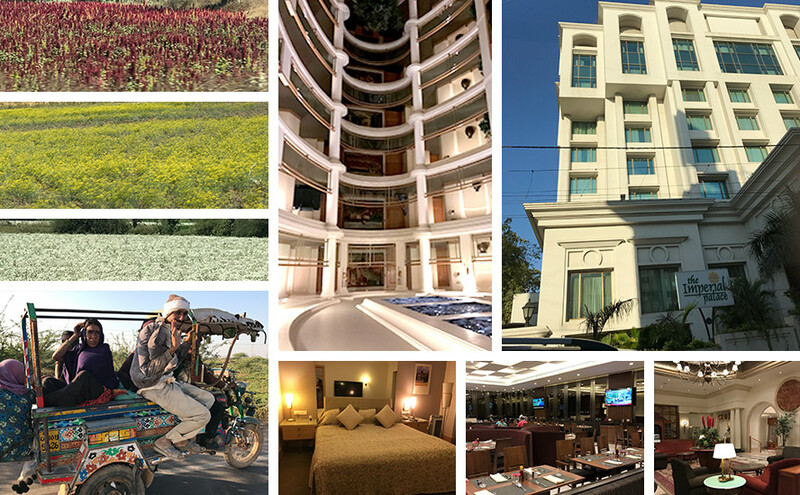 The Imperial Palace Hotel Rajkot, rajgire, Mustard and Coriander Fields. The sun was all ready to set as the evening spell came knocking and with it also ended the course of gazing the world through the car windows. We had reached Rajkot by now. A night halt was scheduled in Rajkot, so we decided to stay at “The Imperial Palace”, a hotel decked with all modern facilities. We dozed off here after feasting on great authentic Gujarati delicacies for dinner, which included Chaanch, Buttered Bajra Rotlas, Masaledar Baingan(Valod), Khaman Dhokla & Gajar-Mirch ka achar. The next day was planned to get Shivmaya, worshiping and hailing the indisputable base of glory, the magnanimous, Lord Shiva. 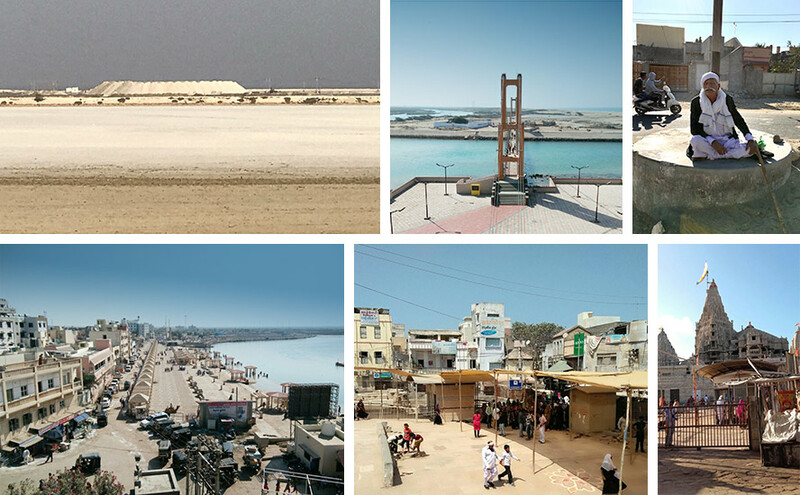 Aiming to complete the 196 km highway route from Rajkot to Somnath, we commenced the journey via NH-18/NH-27. We had just completed 68 kms, when we were astonished to see a bed of rainbow sarees in the golden sunlight enlightening the abundant cotton fields of the area. We were soon witnessing the expansiveness of the cloth printing business of Jaitpur. The process of coloring the sheets, printing and cleaning was going on full swing in this region of 6000 printing units. The skilled artisans imprinting Mango, Geometric, Square shapes on Poplene, Camrik, Polyester and Muslin would do it with great ease printing almost 48 sarees at a time. These skillful artists were working with a target to print 10000 sarees in a day. Here we met Sri Kaushal Bora, a businessman in the same trade, who shared with us the information about 2.5 lakh artisans coming from 10 states and being benefited by the Jaitpur Cloth Industry. He also told us that the sarees we saw on the highway were worked with “Silicate” (permanent colors). 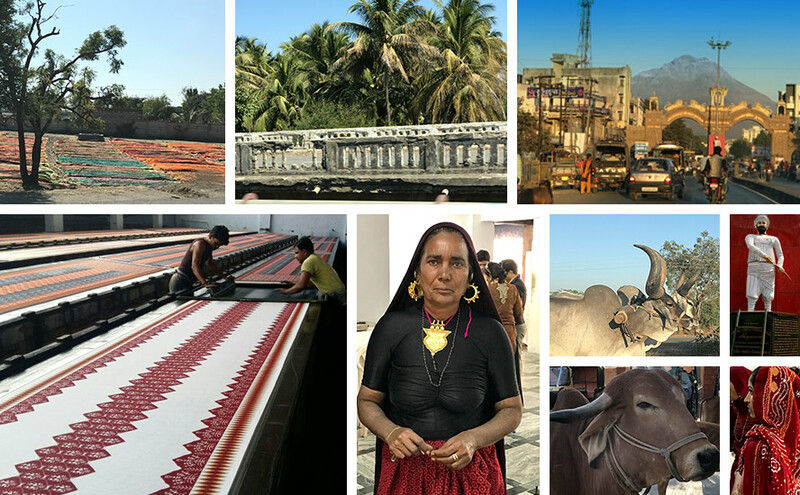 Jaitpur Cloth Industry, Dewayat Border, Ahir Lady, Kankareji Ox, Gir Tea, Girnar Mountain Junagad. The demand of these sarees, printed by the artisans of Bihar and Rajasthan, is the highest in Bihar, Bengal and Nepal during Durga Puja. We were directly witnessing the unique manifestation of cultural assemblage. At that time Kaushal ji told us about Khanga and Katinga, the traditional attire of Nigeria and Congo being printed here in large numbers. Astonished with the unique fabric of culture, we came back to the national highway. Now we were seeing brownish cows of Gir, the one with an elevated forehead and give 22 liters milk a day. Whereas, we also found the long thorn Kankareji Oxes of Sabarkantha in abundance here. In the process of ogling the castor & groundnut yields and the houses drenched in succulence throughout the year, suddenly our eyes were stuck on a Yogi meditating on the mounts of Girnar, the king of mountains. Once a playzone of the Yadukul clan, this divine mountain is known as Raivatgiri & Ujjayant. We saw the idol of the kathiyawadi, trustworthy and devoted “Devayat Boder” adorning Choyani, Kediyu, Topi and Mojadi infront of the grand entrance at the Junagad Bypass Square. Fortunately, here we met a local teacher (Gujarati Language) Sri Ram Bhirvan, from whom we tried to know about the story of ‘Devayat Boder’. He told us that the tale of Ahir ladies of Saurashtra wearing dark Pernaas and Odhnas is also linked to the devotion of “Devayat Boder”. Actually the ruler of Junagadh Ra’ Divas entrusted Devayat Border with the custody of his son Ra’ Navghavan before leaving the mortal world with his wife. Facing unbearable opposition and atrocities from the enemies, the devoted and loyal Devayat Boder sacrificed his own son to save Ra’ Navghavan. It is said that from the very same day ladies of the Ahir community stopped wearing colors and started adorning dark clothes. An interesting personality, Bhikan Ji took leave from us saying Jai Sri Krishna, after telling us about the importance of “Praan Jaaye Par Vachan na Jaye” in the characteristics of Kathiyavadi. Moving ahead we saw mango gardens laden with raw Kesari Mangoes, Cheeku and a bunch of Coconut Trees on the roadside. 70-80 pieces of coconut laden on one tree, after which came the turn of savoring the Kadli Bananas of Saurashtra. Seeing the unmatched splendor of the supreme creator, we were recalled the phrases of the great poet Pant. Leela lahron ka sansaar “. By now we had reached the ultimate onto-logically pious and prosperous Sri Somnath Teertha Dhaam. Entering the region from the Digvijay gate, even the radiating rays of the glowing Sun seemed humbled by the invincible grandeur of Sri Somnath Teertha that was in front of our eyes now. Here we met Purohit Sri Purab Trivedi. He introduced us to acharya Kirtidev Shastri, a renowned authority of Sanskrit Literature and Astrology, honored with the titles of Mahopadhyay, Vidhyavachaspati and Karmakand ratnakar. The soft spoken, elderly, warmhearted Pandit Shastri explained the supremacy of Sri Somnath Teertha described in the Prabhas Khand of the Skand Purana in his own words. Sri Shastri clarified that the excessively bright radiating ‘Prabhas kshetra’ is glowing with the light of the Sun and Moon. This sacred pilgrimage is predicated as Bhaskar because of the Sun and Som Teertha because of the Moon. The glorious place satiated with positive energies is decked with 16 phases of the moon and 12 arts of the Sun. The sun is the life element of the immobile world. The Sun is life and the moon is Rayi, where the women power is known as Rayi. Life is autoclave whereas the Sun is the enlightener. Okay!!! We knew that the words of scholarly masterminds are not to be questioned. The sun is Bramha at the time of Rise, Maheshwar in median and Vishnu at the time of Dusk. The glorious place containing elements of Bramha, Vishnu and Mahesh, is known as Harihar Teertha because of the communion of Shaiv and Vaishnav Sects. The western place of this divine place is considered as the place of Vidhyuta, The East as the place of Deepta, South of Sushma and North of Amogha. In shastras, the prabhas is also divided in 5 regions. Aadhyaparabhas, Vraddhprabhas, Jalprabhaas, Krutsmarmprabhaas and Mahaprabhaas. Prabhase Paragati, Prabhase Parabhakti, moksha even after death is only possible with the bhakti of Shiva. This divine place is the meeting place of the East flowing Saraswati, Hiranya Kapila Nakayu and Vrajni rivers. This is why the Saraswati is also known as Panchstrota. Out of these, two rivers are now extinct. A long exhale and Shastri Ji’s showering Knowledge continued and we were spellbound. Beti…this is a vast subject!! Added Shastri ji. Aditya Narayan is Bramha. Earlier it was Asat then Sat(being task oriented), then it sprouted in the shape of an egg from which erupted the Silver & Golden blocks. Earth is Silver and the upper region is Golden. The chorion of the egg is flesh, the secundines are mountains, rivers are arteries, bladder is the sea and what was born out of it was the Sun. We relate the 12 Jyotirlingas to the 12 types of lights of the Sun. The divinity of the Prabhas area can be determined from the fact that Lord Sri Krishna himself chose this place for the incarnation spectacle. It is written in the Skand Puran that the Jambudweep on earth is divided in 9 parts, one part of the nine parts of India is Saurashtra and the ninth part of Saurashtra is Prabhas. Okay! As we inquired about the designation of Sri Somnath from Shastri Ji, the wedding tale of the 27 daughters of Brahmdev’s soul son Daksha Prajapati with the mighty king Somraja, the son of sage couple Atri and Anusuiya came into light. The moon’s power increases and decreases in every 15 days due to the blessings of Lord Shiva, which were earned by the moon after an asceticism of centuries. The legend has it that once Daksha being agitated by the divine love of moon towards Rohini and the neglect of all other wives and of not getting an expected response to his warning, cursed the moon of progressive increase in its depletion. Then several lords requested Daksha Prajapati of relieveing the moon of the curse of deprivation, while moon himself prayed to Lord Shiva after which he was partially relieved of the curse. The place is called Prabhas since the day the moon got its shine back. The tale of Moon and its 26 constellations is also related to a astronomical occurrence. 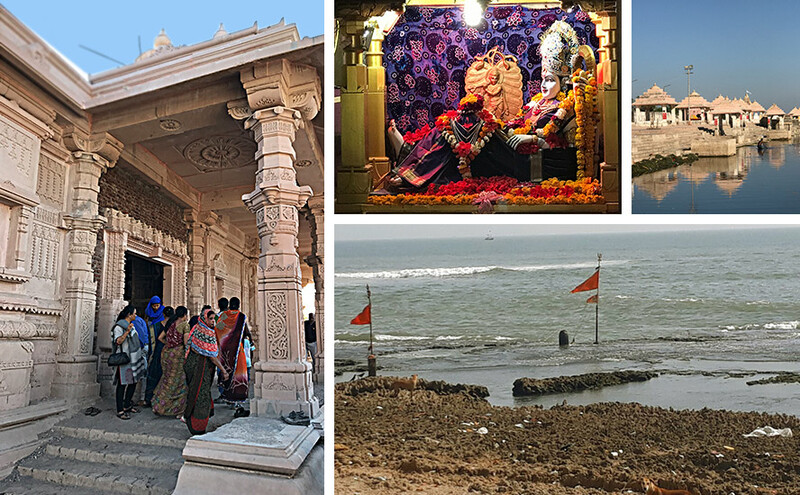 It is believed that after a lot of persuasion from moon, Lord Shiva agreed to stay here and this region was celebrated as Somnath Shaivteertha. In our region, Somnath is considered as the best of all pilgrims, Said Shastri ji. “Now ask me why do we say Sahastra Varsha? – because one Ayan is Uttarayan, the Day is uttarayan and the Night is Dakshinayan. We believe that a day has three seasons that’s why a day is a full Samvatsar. Then again a long pause. We paid our gratitude to Shastriji and left. Standing in the Somnath premises we were compelled to believe that the power of resolution has been considered as a form of Shiva in Indian Philosophy. Shiva rules the universe by the power of resolution. The Indian view of Satyam Shivam Sundaram is highly persuasive. 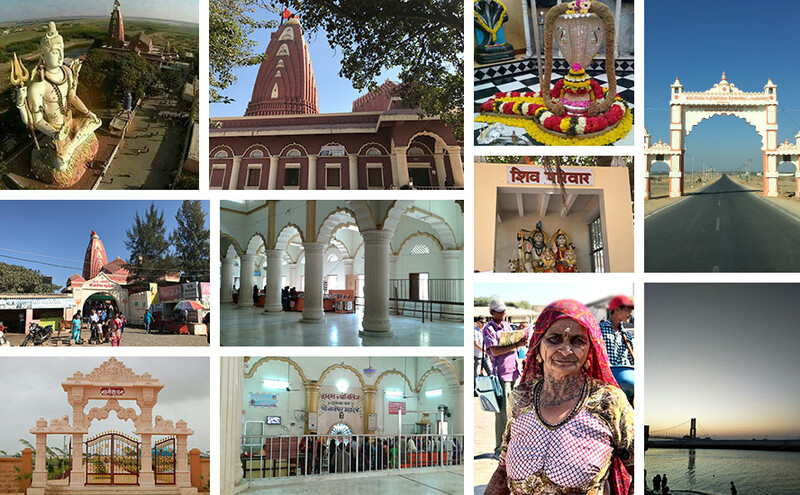 With the cheers and shouts of Jai Somnath, the pilgrim which has sustained a series of attacks since centuries, keeps on getting glorified with time. The glorious 104 feet flag aflare with pride on a 37 feet flagpole placed on a height of 155 feet from the ground, is a symbol of its undefeated prestigious history. Somnath is the nose of the country, we bowed to its intactness and entered the Shivalaya. It seemed as if the divine devotion unified with ethereal beauty had landed here. Following the new arrangements of the temple, we offered Gangajal to the lord in the replendant Garbhagrih. Worshiping the Jyotirlinga which has originated by virtue, we prayed to Nandikeshwar and started capturing the glory of the Temple premises architected in the Kailashmahameruprasad style. The garbhagrih, sabhamandapam, nrityamandapam, 72 artistic pillars and toran of the 9 storied temple architected in the Nagar style by a master in Temple architecture, Sri Prabhashankar Sompura, were just stunning. There was a direction signage on the parikrama route on which “ Aasamundrant dakshin dhruv paryant abadhit jyotirmarg” was written which indicates that there is no land ahead of this shore. Marching straight from here we reached the Juna Somnath Temple where the great Queen Ahilya Bai Holkar glorified the Lord Somnath Jyotirlinga. Purohit Purab Trivedi ji performed poojan of the 4.5 feet grand Jyotirlinga following all rituals and traditions. We were all Shivmaya after worshiping the Sadashiv with a pacified mind in the Shivteertha enriched with the elements of supreme consciousness. Purab ji told us that the actual height of the Jyotirlinga is 22 feet. The Mahapooja is done here in 3100 Rs., Mahamrityunjay in 5100 Rs, Laghurudra Pooja in 15000 Rs. (pathatmak) & 21000 Rs. (Homatmak) whereas the Maharudra Pooja is done in 31000 Rs. There are around 250-300 houses of Sompura Brahmins near the temple, the Sompura Brahmins take care of all the arrangements of the temple. Pandit Purab Ji came along as we had to go to the Dehotsarg Teertha Complex. We saw a fleet of boats at the Veraval Docks (also once known as Devpattan) at the 4 km route of the complex. The thought of crossing the ocean of life on the Shiv named vessel came to our mind. Here we were told about the 40 feet long 20 feet wide and 12 feet deep boats made of Malaysian Salud wood by a boat maker, Sameer. Several such saffron boats worth Rs 40 lacs were being made here. At some distance his father was busy giving final touches to a 176 feet long, 50 feet wide, 26 feet deep, 1700 tonne ship. The buyers of this 5 crore rupee ship come from places like Dubai and Africa. On our way we were astonished to know that the Raag Bilawal, a genre of the Indian classical Music originated from this place. Our minds were overwhelmed after reaching the pilgrim from where lord Sri Krishna departed, where the lord of mercy culminated his spectacle of life and left the earth. We saw the walls engraved with the 18 chapters of Geeta in the Geeta Temple after visiting the Sri Krishna Sthali at the banks of Hiranya river. Purohit Purab Trivedi told us that the age of Sri Krishna has been calculated 125 years 7 months and 6 days as per astrological era calculations. It is a belief that the elder brother of Sri Krishna, Sri Baldev Ji, who was himself a reincarnation of the Sheshnaag, entered the hades from the sea-route here after the demise of Sri Krishna. We reached the Bhalikateertha after accepting the blessings of the dust of Sri Krishna’s feet at the Shraddha Teertha, renovation work was going on here. Lord Sri Krishna is beseated in a relaxing position at the divine place located between the Veraval Docks and Somnath Patan. The Bhalkakund is also situated here. Pandit Poorab Trivedi told us that the Yadav clan was destroyed 36 years after the Mahabharata, because of a curse from Gandhari, who came to Dwarka from Mathura after the great renunciation of Lord Krishna. The same commenced due to Sri Krishna’s son, Saamb impersonating as a pregnant lady. The plunger originated by Saamb, who was cursed by the sages, was powdered by Agrasen and floated in the sea which lead to the formation of a pungent Erak Grass, which was later instrumental in the destruction of the inebriated Yadav kins. The beheading of Kritverma by Saatyiki, who was inebriated by drinking a liquor named Maraiyyak triggered the spectacle of destruction of Yadav clan. Trivedi ji told us that witnessing the destruction of his sons, brothers and others of the yadav clan,the kindhearted Sri Krishna was shaken and the aims of his incarnation were over. He was already devoid of his divine powers. After a hunter named Jara took him as a “Mrignayan”because of glimpse of the lotus on his feet and hit him with an arrow a shining constellation detached itself from the lifeless body of Sri krishna and enlightened the world. The 12 feet long divine body of the Sri Krishna was cremated by Arjun. After which the mortal remains were immersed on the Triveni bank where the Saraswati unites with the Arabian Sea. The next stop of our sojourn was the Triveni Sangam. Here mortal remains were being immersed and last rites were being performed. We were choked with emotions. Here we also got to know that the mortal remains reached Jagannathpuri through the sea and the idol of Lord Jagannathpuri is created by these remains in an interval of 12 years. Standing infront of the vast ocean, seeing the setting sun we were thinking that the sea, once a helpless witness to destruction on its swaying atremble waters, is so proudly exhibiting efflorescence today with the regeneration of the culture. After seeing the glory of the illumined temple in brightness we left for Rajkot as the light and sound program to present the history of the place was adjourned without reason. 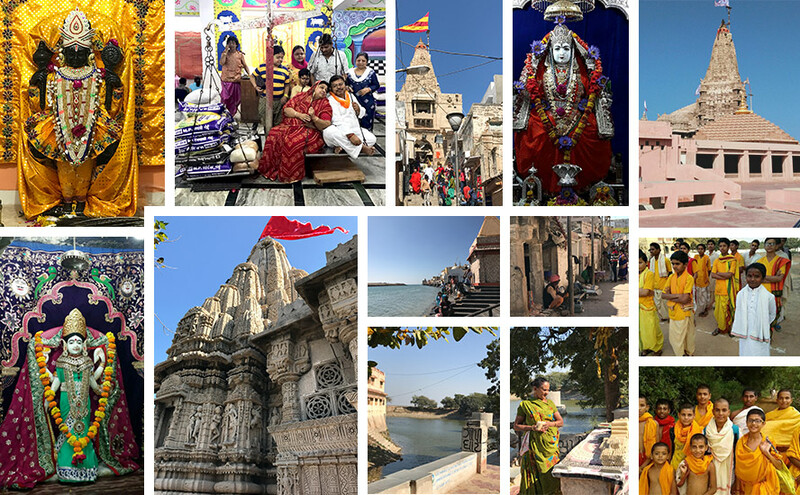 The next day at the honeyed dawn of the Sun’s aurora, we gushed to Rajkot with an aim to visit Dwarka Teertha, the one counted in the chaardham and saptapuris. we reached the karmsthali of the selfless lord Sri Krishna after a 3 and a half hour journey on the NH947 Highway. It is believed that Lord Krishna had himself chosen this place for his incarnation. It is also believed that the dust of this place when blown by the wind can also pave the way of redemption. The heap of dust seemed to have landed from the sky with pale wings in the streets which have been getting paled from the sunlight since centuries. We proceeded to the Jagat Temple from the Swargdwaar to enjoy the proximity to the god. Passing the security circle as we entered the temple spirited a divine aroma we met Mahopadhyay Dr.Jaiprakash Narayan Dwivedi Ji, a writer who has ratified the flow of culture through his writings. A director of the Dwarkadhish Sanskrit Academy, Sri Dwivedi cited proverbs to present his views. “A tulsi leave is never small or large, drenched in the flavors of devotions this is the place of Lord Krishna. Krishna means Power and retirement which is representative of happiness. Lord Krishna himself is the the supreme creator, gloriously invincible, discreet, unbiased, devoted and Dwarka is the moksha teertha of effectual power. See, in Kathiyawaad, the “sea” is the “Kathi” and the country is the “Waad”, means a place of which the sea is the border line. 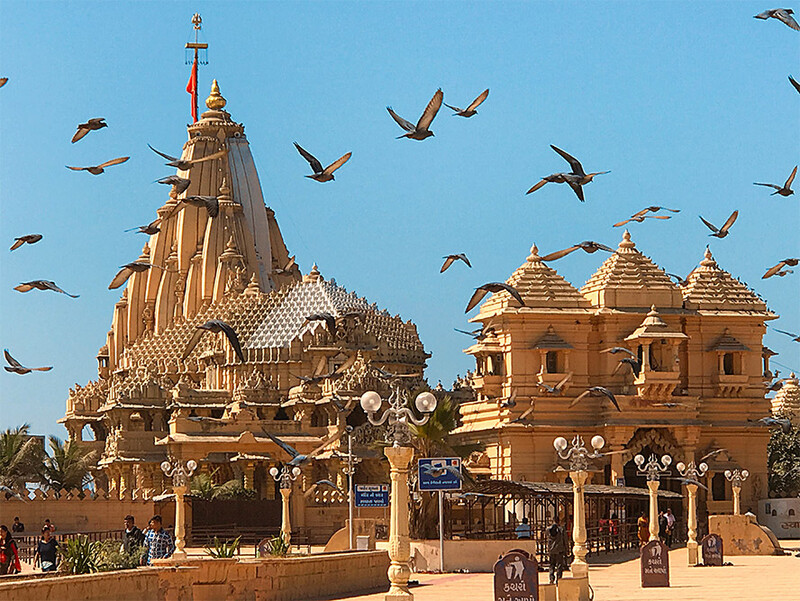 The grandeur of the spirited land of Dwarka is such that the creatures like insects, birds, animals, reptiles are also free from their sins. As per the Skandapuranokta, the spectacle of the ‘achintyah khalu ye bhavah, natantsarken yojyet’ the lord is unperturbed. This land is consecrated by the divine feet of the devote Lord Krishna. Nurtured by the religious teachings of Sri Krishna, the inhabitants of this place are all followers of his words. You go and leave a valuable item anywhere in the city, you will see that no one will even touch it. Here, if a needy person requires an amount of Rs 25000 and asks for help from a local person, then without making a fuss about it and depending on one’s ability, the person would at least provide him with Rs. 10000 and discreetly. The Words of Dwivedi ji were so impressive and commanding that we thought not to interrupt him in between. 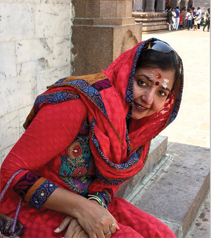 The women of Dwaraka are Cultured, conservative and tolerant. Not physically, but soulfully beautiful. Like the ambient character of the temple is inferior in beauty than the beauty of the idol. As we asked him about the water shortage, he said that there are a lot of rivers in the area, one just has to look into the eyes of the people that are full of water. The rooftops of houses get cleansed with the first showers, the second rain showers are then conserved in the tanks on rooftops. Some drops of gangajal, brought from Haridwar are then dropped in it for sanctification. The devote citizens of Dwarka start their day at the bramha mahurt by reciting the Bhagwat, eat pure vegetarian food which is prepared without onions and garlic, a place where there are no cinema halls, a place where people eat grapes but the grapevine is prohibited, such a place is bound to be the epitome of sacredness. Isn’t it right!!! The incharge of Ved Vidhyalaya (the Kauthum Branch of Samved), great scholar Sri Dwivedi sees the indian coordinating views based on the principle of “ Nana tatva me Ekatva” or unity in diversity, related to the Poetry volume of Sorthi Birjabhar written in the Bhojpuri language. In which the heroine is from saurashtra, the hero is the nephew of Todarmal from Madhya Pradesh and the echoes of which are heard in Bihar. Our Indian culture is inherent in this only. Is it right? He continued. At around 12 noon some activity was seen at the Dwarkadheesh Temple. This is the time when the lord is offered the Rajbhog. A delightful quivering was rampant everywhere as soon as the group of Googli Brahmins, laden in Jugalbandi Poshaks, entered the temple with a silver plate of delicacies. Here let us tell you that the task to serve the King of Kings Dwarkadhish is assigned with the Googli Brahmins. Here around 850-900 Googli Brahmin families are living and dedicatedly serving Lord Sri Krishna. We also contacted the chief of the Googli Brahmin community and expressed our interest to know more about their traditions and customs. He cited the 2 types of Rajbhogs, one being Anusakhadi meaning a dish made of Laddoo and milk, meant for chewing-eating-sipping and the second being Sakhdi (kacchi rasoi) consisting of Daal, vegetable preparations, Rice, etc. He also told us that Bhogs are offered to the lord 11 times a day. Mangla Bhog, Makkhan Mishri Bhog, Saamb Bhog, Sringar Bhog, Madhyanh Bhog, Raj Bhog, Bantha Bhog, Utthapan Bhog, Sandhya Bhog, Shayan Bhog and Shayan Bantha Bhog. As per Sri Purohit, the mangla Aarti is performed at 6.30 every morning, Abhishek and Panchamrutabhishek after bathing from 8-9.15 am, Snaan Shringar Bhog from 9.45-10am, Shringar darshan from 10-10.30am, Aarti bhog from 10.30-10.45 am, Gwal Darshan from 10.45 to 10.55 am, Madhyanh Bhog from 11-11.25am , Rajbhog at 12.10-12.25pm, Vishram from 1 to 5 pm, Utthapan Bhog from 5.30 to 5.45 pm, Sandhya Bhog from 7 to 7.45 pm, Shayan Bhog from 8 to 8.25 pm, Shayan Aarti at 8.30, Darshan from 8.35 to 9.00, Stuti from 9.20 to 9.40 and the gates are closed after recital of Mantras at 9.40 pm. He said that at night time lullabies are sung in-front of lord Sri Krishna. A game of Chaupad is arranged for him before Vishram and Shayan. Not only this, the colors of the attractive dresses selected for his adornment are also special. Like on Monday the dress is Pink, Yellow on Tuesday, Green on Wednesday, Saffron on Thursday, White on Friday, Blue on Saturday and Red on Sunday. The sight of Lord Sri Krishna decked with gems and Jewels is alluring. Tulsi Jal is offered in the feet with Vishnu Sahastranabh Path in the Kshatriya form of Sri Krishna. Acharya Purohit Ji gave us the information of this seven storied artistic Temple with 84 pillars being constructed by Brujlaabh, the great grandson of lord. The 56 steps, the 52 feet high flag, the 52 small flags are often related to the supporters of the religion and 56 koti yadavas. The 52 officers along with Balram, Sri Krishna, Aniruddha and Pradyumn Chartuvyuh symbolically represent the management of Dwarka’s Rajprasada. By this time Purohit Amar Jitendra Upadhyay also joined the conversation. He told that the 5 time flag hoisting ceremony is organised on a large scale, a Shobha Yatra is also organised before flag hoisting. A pre-agreement has to be done by the devotees to carry out the same. Currently agreements have been done until year 2022. The Aboti Brahmin Community is responsible for developing the flag, its mounting and demounting. All the donations and expenses of this ritual amount to Rs 2 lakh approximately. There is a glittering Jagatmata Temple on the fourth floor of the Dwarkadhish Temple, who is considered the protector of 10 directions. It is mostly inaccessible for the common man. The perspective of the Ranchhodrai Temple is indescribable. Here the lord himself offers pleasantries. The process to worshiping and bowing forward in the 16 temples in the Dwarkadhish Temple Complex started with the Ashtpat Rani Temple and was completed after visiting the Gopal Krishna, Lakshmi Narayan, Durvasa, Sri Trivikram Rai, Madhav Rai, Raja Bali and Sanaktadi idols of the kumars, Pradyumn temple, Durvasa Temple, the Kuveshwar Temple near the Mokshadwar without visiting which the journey is considered incomplete, Amba ji, Purushottam Ji Dattatrey, Mata devki, Satyabhama Temple and Kolabhakt Temple. Coming Downstairs we reached the Gomati Ganaga Ghat right from the Mokshadwar. This is the Gomati Ganga made from the divine feet of the Lord. All the devotees gather at the Balram Ji Temple for Tuladan after getting cleansed at the Gomati Ganga. We followed the same. 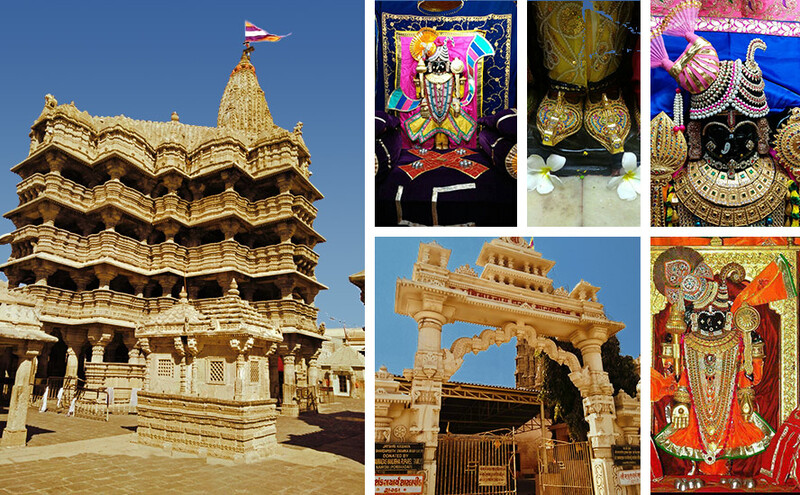 The ritual of Tuladan has a special nobility at the Dwarka Teerthdham. Purohit Amar Upadhyay explained the incomparable importance of Tuladan based on Yadnaswaroop, Rajogun and Satogun. As per the yadnaswaroop, Ghee equivalent to the weight off the Bhavik is donated. Sugar, Rice and Ghee is donated following the same in Rajogun and in Satogun Urad Dal, Moong, Ghee, Oil, Sugar, Rice and Wheat are donated as per one’s capacity and ability and circumstances. These donations are then distributed among the needy families of the Googli Brahmins. Among the several tales of tuladaan done for relief from diseases, undesired circumstances and Navgrah Shanti, the tales of Sri Krishna along with wife Satyabhama performing Tuladan to relieve their son Saamb from leprosy and a depressed Dharmaraj Yudhisthir performing the same as an act of repentment are cited in Mahabharat. Whereas a tale of Satyabhama, following the teachings of Narad who wanted to humble her, keeping a Tulsi dal in the tuladan, after the same being incomplete even after donating all her gold and everything is also cited. The truth is that all the attainment of mortal humans is explicable only after chanting the name of Lord Krishna. Everything is non-essential in comparison to even the dust of his feet. The Sharadamath is located in the Temple Premises only. Here let us tell you that considering India as a Yagyabhoomi, Aadi Shankaracharya established 4 monasteries (Math) in all the 4 directions of the country. The direction of Samved being west, the Sharada Math was established in Dwarka. Aadi Shankaracharya has said in mahanushasan that these monastries(Math) will consecrate the treu religion. Gods and Goddess have also been destined in all 4 Mathas. Mesmerized by the recital of Vedas by the boys here we curiously moved towards the Math. Here we met Sri Prakash Pandey Ji, who himself is associated with teaching work here. We were astonished to see the flourishing Veda Culture in this Vedashala having around 100 students and 15 teachers. Students who complete 5th class get admission here after an entrance test and come out being Acharyas. After coming out seeing the stunning and memorable visuals as P kaushik( a local vendor)was telling us about the Sunlike Naivedya Maisoop and Thor (traditional sweets made of Besan and Sugar), Purohit Amar Upadhyay clarified our query about dwarka getting immersed in water after the culmination of Sri Krishna’s Spectacle. He tells, “Vishwakarma developed a Golden Dwarka at Kushastahli(Dwarka Puri) as per the orders of Lord Purushottam. The ocean contributed by shifting 12 yojnas back. The Yaduvanshis were brought here in Sleep, when they woke up, they urged for the way to go out of here, the “dwar-ka”. Here ‘ka’ means the gate of salvation. Sri Krishna was immanent, this is why before going to the prabhaas areas, he ordered the ocean to take his real place. After the immersion of dwarka under the water, Brijnaabh developed Shikhar Dwara(pashaan Dwarka) in the remembrance of his father Lord Krishna as in Kalikaal, the habitat of Kaal has been considered in Gold. Okay!!! Purohit Ji kept on speaking, and we were all ears. We requested archaeology expert Sri Narayan Vyas to shed more light on the issue, as he was present in Gujarat at the time of excavations. Sri Vyas agrees to have found one temple in-front of Jagat temple and 3 behind it, in total 5 temples in the survey. Several artifacts and utensils dating 5000 year back were also found in the excavation. Sri Vyas also believes the facts and findings stating the inhuman atrocities faced by the 37.85 meter high Dwarkadhish temple and the stories of it getting even mightier after each such attack. We stopped at the Gopitalab after leaving the Jagat Temple. In a periphery of just 20-22 Kms wherever we went, the bright shining sun followed us like an attentive guard. This place is also filled with the magic of God. There are phased tranches of tales stating the reason of the yellowish soil of the Gopitalab. These include the tales of terror of kaba robbers who originated from the hand cleansing of Sri Krishna, the Jal samadhi of Yaduvanshi women to protect their dignity and the Gandiv of Arjun getting ineffective. Applying the smooth soil “Gopichandan” made from the bodies of divine women, is sure to give physical and Soulful satiation. The Naageshwar Jyotirlinga Temple is located ahead, which is renovated by the donations of Bollywood personality Gulshan Kumar. Although, the Nageshwar Jyotirlinga is believed to be situated in Maharashtra. But keep in mind that even after counting the the drops of water and the particles on earth, it is impossible to calculate the worthiness of the almighty Shiva. This is why it is beneficial for us to just worship Shiva wherever he resides. Thinking the same, we performed Jalabhishek at the Sri Nageshwar Jyotirlinga. Here we met the chief Pujari Harish Phoolbharti Goswamiji. He told us about the significance of worshiping Shiva exposited by Lord Shri Krishna himself. He also endorsed the fact of Sri Nageshwar mahadev worshipped by Jagatguru Adya Shankaracharya, being amongst the twelve jyotirlingas. Sri Goswami relates the darukaavan with Dwarka Region. 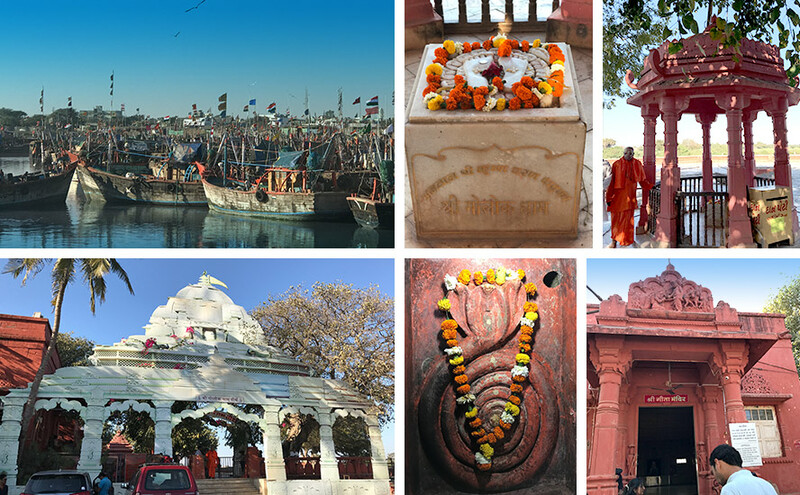 There is a Shri Shani Temple and a grand Shiv parivar on the 1 bigha land conserved by the Goswami family and the huge Shiva Idol is the attraction of this place. Sri Goswami tells the tale of Shiva taking the Jyotirlinga avatar here after the tapascharya of a trader who was harassed by the Daruka Rakshasa Couple. There is a practice to offer silver pair of Naag-Naagin here. It was surely the effect of this awaken earth that the building made of “Gajiya”(yellow stones) and the mesmerizing beauty of sunrays rouged in turmeric, made the ambiance divine. By now we had reached the Rukmani Ji Temple. AT this grandly embellished temple we performed the ritual of donating a water tanker. Purohit ji told us that as Durvasa Rishi gave her the curse of separation from Sri Krishna, Mata Rukmani Ji was assured by the lord himself that she could worship his idol even in the time of separation. Wow! such a very beautiful and amazing pictures. Great and nice inforamtion. Thanks for sharing your travel experinces. Really very interesting post. I really got so useful information by reading your post, this is truly helpful. …thanks for sharing this. A mass-communication post graduate and a research based journalist, writer and a keen traveler, I started my professional journey from The Times of India Group. Personally, I like travelling to exciting destinations and empirically exploring cultural anthropologies sans geographical limitations. This blog is in fact a fusion of my journalistic background, my writer skills and love for travelling to share real time road travel experiences whether in India or abroad. Travelling, and especially by road excites me more than those mostly monotonous air and rail journeys. As ‘Disha’ literally means ‘direction’, I would love to take you to some real soulful long road journeys to all possible directions through this blog. My regular contributions in Swagat & Namaskar magazines have inspired me to bring all my travel dotes on this blog. Currently I’m also working on my Book in collaboration with French painter/writer on History of Bhopal. Welcome to The Road Diaries. Hope you’ll love to visit this place often to share soulful sojourns with me!